Guillermo Callau created a very original communication device concept called Textube, based on text messaging and social networking. This is a mobile versatile texting device, that allows the user to receive and write short messages and thumbnail images. Textube relies on a translucent semi-rigid plastic with integrated electronic circuit. 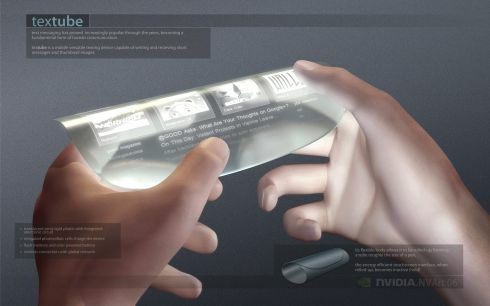 Basically you have a rounded plastic piece of material in your hands, that’s both flexible and transparent. It also has some sort of lighting mechanism that makes it stand up through brightness. It also has integrated photovoltaic cells, that charge this gadget. Guillermo’s concept has flash memory, a solar powered battery and wireless connection with a global network. The flexible body of the communication device allows it to be rolled up, forming a tube that’s about the size of a bigger pen. When the gadget is rolled up it becomes inactive and saves a lot of energy through that. I hope that unlike the picture, the concept’s interface is not only black and white and it’s also able to show colours.